Daily Beer Review: Decadent Imperial I.P.A. 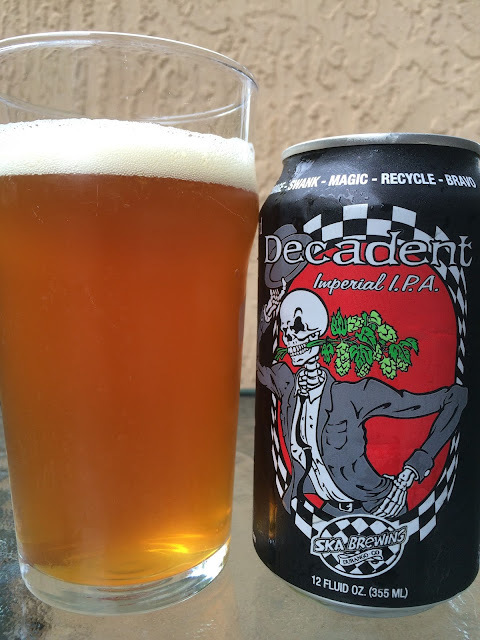 Back in 2010, I checked out a bomber of Decadent Imperial I.P.A. Today I'm going to repeat with a can of the same beer. Despite the packaging difference, the artwork depicting a skeleton in a suit and top hat, hop branch in his teeth, remains the same. 10% alcohol. Lightly fruity aroma, orange, not very noticeable. Flavors also not overly pronounced. Orange marmalade, honey, rich and chewy body to start. The alcohol is definitely not shy letting you know its presence (and I definitely didn't really like that aspect)! Citrus, a little spiciness. Dry at the finish. "Decadent" didn't come to mind, and again, the alcohol needed to be incorporated much better.